A woman's review of the science fiction and fantasy genre, whether in books, movies, or television. My Comments on Science Fiction / Fantasy Books and other related media. I was skeptical about watching the Flash on Netflix. I had never read the comic book so didn't have a clue what to expect. It is amazing! Really, I would recommend to anyone who likes action/hero themed television shows or movies. Coming in to this series without any pre-knowledge wasn't a hinderance to watching the Flash. The series starts at the beginning on how he obtained the super power of speed. There is also background on his life and as the series progresses, you see the background of the other characters as well. It's funny yet it can be very sad that it can make a grown man teary eyed. The only problem I had with this series was the way the character of Barry Allen, the Flash was developed. He could be so emotional and not think things through. I also found some holes in the script as I watched the series. I figured some clues out before the characters did. But I have to say it was a thought provoking series, really. My husband and I would discuss what was happening and share our thoughts about some of the mysteries in the series, like who Dr. Wells really is or who is the Reverse Flash. What is nice about the Flash, is that the first season dealt with one problem with a cliff hanger then the second season started with the cliff hanger and introduced another villain. We watched the second season on Amazon Prime since we don't have cable so now we"ll have to wait a year to see it again which is a bummer! I can't wait till season 3! Star Wars has become again a popular franchise with the advent of the movie opening of Star Wars: Force Awaken. This has spun-off comic books and graphic novels that I'm really enjoy reading. What I liked about the series is the characters look like the actors in the movies. It's familiar and the character development was much like the original Star Wars movies. Each of these spin-offs has a comic book series but I rather read the full novel than buy the individual comics, basically the graphic novel is a little cheaper than buy each individual comic, I like the feel and look of the novels. The illustrations in the novels is beautiful and the story lines are really good too. Star Wars: Skywalker Strikes graphic novel takes place after the rebels have blown up the Death Star in "New Hope". Luke is having troubles controlling the force which is reasonable since he just learned he had the power. The rebels have a mission to Tatooine to blow up the weapons factory there but as usual the mission doesn't go as planned. Later Luke goes to Obi-Wan Kenobi's old place to learn more about his mentor. As this time, Darth Vadar doesn't know who Luke is until he sends Boba Fett to Tatooine for information. Darth Vader graphic novel is very interesting since this is about him and his relationship with the Emperior, Darth Sidious. There are also scenes from his past when he was Anakin Skywalker, the Jedi with Padme Amidala. the graphic novel Kanan: The Last Padawan is a must read. We actually get to see his beginnings before and after the Clone Wars. He was just a Padawan when his master is killed by clone troupers and had to survive on his own. I really enjoyed these comic graphic novels because it gives you some information about the characters form the movies and what they were doing in between each episode (or film). "Witch's Familiar" what an odd name for this episode, is the Doctor the witch with Clara as his familiar or is it Missy to the Doctor? I'm not sure but it was an exciting episode. Recap, Davros is dying and wants to talk to the Doctor. Missy and Clara have been exterminated by the Daleks in episode 1 but the opening scene in episode 2 has Clara tied upside down outside the Dalek compound with Missy saying how peckish she is then starts explaining how they're still alive. She tells a story about how the Doctor escaped death by using a similar trick. Davros and the Doctor are talking, there's some dream sequence of the Doctor pointing a Dalek gun at the young Davros. Davros is spouting regrets and we see the Doctor eventually soften to the Dalek leader. We, as a viewer are soften to Davros's words, but we know where he came from and why he made the Daleks so we shouldn't be. Spoiler alert! The Doctor is not moved and in the end outwits Davros. It was a really good episode, I was taken aback by Davros's knowledge of the Doctors past and at the inference that he travels the universe to escape Galifray. What a strange trip the Doctor is on this season 9 premiere! Starts out with Missy (Master) doing some bad stuff to get Clara and Units attention. Where's the Doctor everyone wants to know? They find him somewhere in Medieval times and rocking out with an electric guitar on top of a army tank. Wow, what a beginning. Another twist is Davros as a little boy who is in need of help. Then Davros is on his "deathbed" and sends out a creature to look for the Doctor. Clara and Missy find the Doctor in a most dangerous situation and in a most dangerous planet.This is a two part episode so we will see how the Doctor gets out of this predicament. I have to say that I'm getting to like this new Master. I didn't care for her last season but she's growing on me. I am totally over Clara. She's become too attached to this Doctor that is very unhealthy if this was real life. Is she a kinda of girl friend? Or a parent/child relationship? I think it's time for a new companion, an alien would be cool like how Tom Baker's Doctor had Leela, Adric, and Romana (she was another time lord), and Peter Davison had multiple companions 3 at a time. But we will see how this season goes. For now, I can't give out too many spoilers for those who didn't watch the season's opener. Resurrection is another novel in the Col Sec series by Jan Domagala. In this novel, the Wildfire Team along with Kurt Stryder and Zara Hardy are going back to the planet Tartaran. They have to stop the Elysium Alliance for gaining knowledge from the research done on the planet that they deem as dangerous technology in the wrong hands. This novel has two running stories, one with the wildfire team and another with a member of the team, Matt. Matt is on another mission that has him following Tara Wilde, the clone daughter of Jonas Wilde. She murdered her father in the last book and has taken over OMEGA. We also get to know some characters from the Alliance; Major Solon, who is the son of General Solon from “Discovery”, General Tillic, and Senator Tovaric. The two storylines eventually converge on the planet Tartaran. This novel is one of Jan Domagala’s best because of the two story lines and of the two opposing perspectives. He does a wonderful job transitioning between stories. The theme of this book of two opposing governments, one with advanced technology not wanting the other to know about or have is reminiscent of what’s going on in our world. This is another really fast paced book and one that I would recommend especially if you have read his other stories in the Col Sec series. 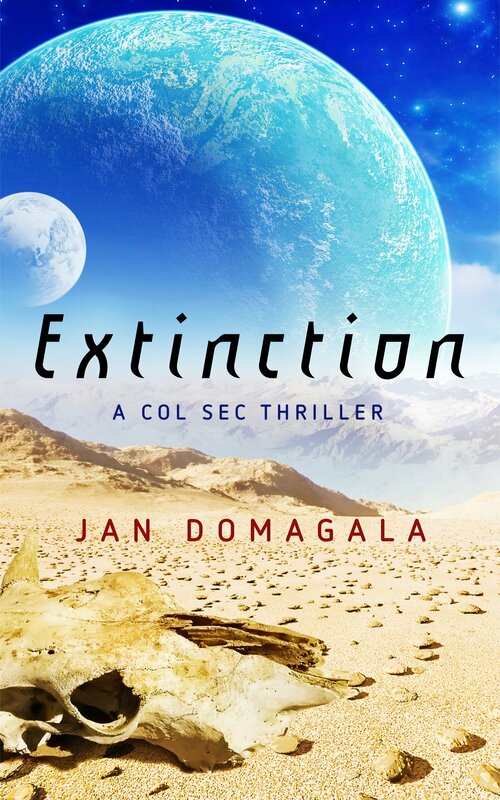 Book Review of "Extintion: A Col Sec novel by Jan Domagala"
Extinction is the 5th book in the Col Sec series by Jan Domagala. The story is a bridge between Jan Domagala’s Retribution novel and next book, Resurrection. The Recon Delta headed by General Sinclair is on another vital mission, saving the world from a computer virus. The background story is 25 years earlier in a research facility on Tarsus II. The head of research at this lab is Doctor Henkel, who was in charge of developing a program that stimulates certain areas of the brain via the NI. Most citizens in this universe have NI, a neural implant that gives them direct access to computer databases and communications. But this program was coded to search other NI and link with it then download the program. It became viral that any infected person can transfer the program to any others with a NI implant. This virus was designed to make the super soldier with increased testosterone and endorphins but it also increases aggression to the point of uncontrollable rage. To contain the computer virus the research facility was abandoned and put under quarantine with no one allowed to enter. While in Col Sec, Jonas Wilde leader of OMEGA, used his security clearance to delve into the sensitive files and found out about the project on Tarsus II. The action begins with OMEGA infiltrating the Tarsus II facility. They plan to release the virus via an array that is connected to the computer. Once the array is functional it will then target the military base on Tarsus Prime with the intention of the virus spreading throughout the human population. Alarms are triggered and the base leaps into action. The only problem is that only a handful of top personal know about the severity of what the facility on Tarsus II holds. General Sinclair is alerted and quickly notifies one of his Recon Delta teams which happens to be on Tarsus Prime. They are looking for a new candidate to join Red Team. Will they be able to save the world? Read Extinction to find out. Extinction is a shorter read than the previous books of Jan Domagala and it isn’t as fast paced either but the action picks up towards the end the book. There are new characters in this book but I feel they will be in other stories of Domagala’s Col Sec series. I would like to see more character development but I realize that these books are crisis driven stories with little time to really know the main players. Domagala gives enough background information that Extinction could be read as a stand alone book. I recommend this book because it’s a good science fiction story with action. Retribution is the fourth book in the Col Sec series by Jan Domagala and is a continuation from the last book, Discovery. It begins with Zara Hardy, who wakes up as a captive of the terrorist group, OMEGA. She remembers being held captive by an Alliance operative, Pavel Norsky who shot her dead. She also remembered being bled on by Kurt Stryder and with her knowledge of the damages that he can endure, it causes Zara to want to know more about her own abilities. Pavel Norsky is also back from the dead and wants revenge. She escapes her captives and finds her way back to Kurt Stryder. All the members of Col Sec Recon Delta team are on leave after the Tartaran rescue mission and each is confronted with bodily harm by strangers that are similar in appearance. They are being assessed on their abilities of their genetic enhancements. Later in the book, we are given more information about the terrorist group, OMEGA. OMEGA is always one step ahead of the team, you know the saying, “The good guys always win.” The problem with that scenario is OMEGA is playing by their own rules and haven’t told the Col Sec team how to play. Another problem for Col Sec is the seemingly unlimited resources at OMEGA’s disposal. The main force are made up of clones with major resources for the best weapons. The Wildfire Team and Kurt Stryder are able to counter each attack by OMEGA and find an outpost on the Moon, but not the secret headquarters on the planet RH426. The climax of the book is suspenseful with a last minute escape of our heros, Kurt Stryder and Zara Hardy, even though we all know that very few authors kill off their main characters. There's a surprise at the end for the head of OMEGA, Jonas Wilde that will cause more trouble for Col Sec in the future. It’s a very action packed book and an easy read. I like that Domagala put thought into character development with this being a series we will probably see them again in future books. The dialogue between characters is believable. And with each book, the characters personalities are recognizable, there is a familiar quality to them. You want the Col Sec team to win over adversity and want the bad guys to be obliterated. But you know that having the villain get away makes for a known adversary in the next book. The issues that I had in the previous book weren’t apparent in this one. The transition between scenarios was more fluid and smooth. I like that Domagala has a few female characters in the series that aren’t one dimensional. All though, they aren’t average looking women but buffed and beautiful. I will read his next book in the series since I’m invested in the characters. I recommend this book to anyone who likes reading action science fiction.